The present show, “Procession’ by Maedhbh Mc Mahon at Fens, Chelsea, emerges from the theme of Ireland’s Magdalene women and their children who were incarcerated in work houses and institutions for large parts of their lives and in some instances, all of their lives. 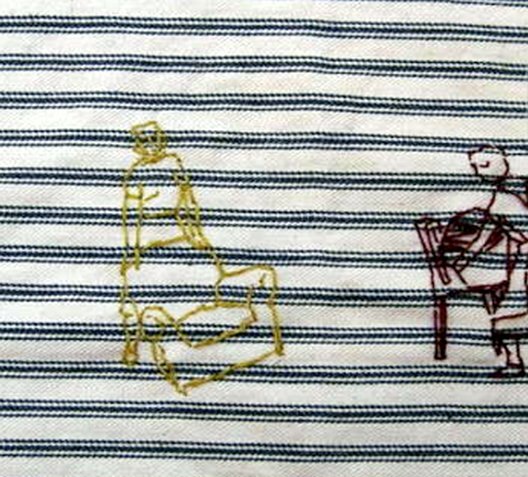 The exhibition contains stitched works and deals with the daily grind of the lives of the individual women and children and the repetitive nature of the institutional life and its domestic chores. The motto that ‘cleanliness was next to Godliness’ was the mantra of these institutions, which were meant to be a place of sanctuary but in many instances were places of incarceration and exploitation, through slave unpaid manual labour. The work is a gesture of inclusion towards those, who for most of their lives were othered and excluded and hidden away behind high grey walls of the Insitituions known as Magdalene Laundries which dominated the landscape of Ireland for generations.